I read this article and found it very interesting, thought it might be something for you. 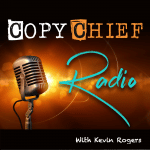 The article is called Ep 111: 3 Paths with Kevin Rogers and is located at https://copychief.com/ep-111-kevin-rogers/. It’s a bold choice, right? Most people just would not choose like you did. But something in us makes it feel like independence is the only choice. I was thinking about you, and me, and the paths we choose and where they lead. So I recorded my side of the conversation I imagined we’d have if you were across from me there at the coffee shop. I hope you enjoy it, and I’d love to hear your thoughts.